Although it is currently autumn, Hong Kong’s weather has been continuously hot and humid. Unable to take the heat while filming Harmony is a Virtue <以和為貴>, Tracy Chu (朱千雪) fainted on the set and suffered from a heat stroke. Feeling unwell during filming, Tracy suddenly broke out in a cold sweat and began having dizzy spells while standing in the heat. 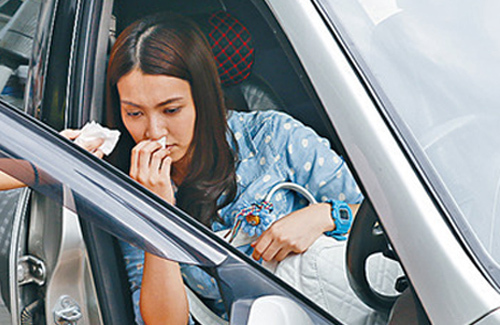 Seeing that Tracy was feeling rather faint, co-stars Joe Ma (馬德鐘) and Kate Tsui (徐子珊) immediately brought Tracy to the company van to rest. Besides Kate, who held tightly onto Tracy in case she fell, the makeup team and filming crew took turns fanning and wiping sweat from Tracy’s forehead. Joe also volunteered to film all his solo parts first so Tracy had extra time to recover. Speculated to have suffered a heat stroke, Tracy’s condition did not improve much throughout the day. The producer eventually ended the filming and let everyone off early. Feeling grateful, Tracy was very touched at how considerate and caring her co-stars and backstage crew were. Contrary to Kate’s usual lively and energetic roles, Kate’s character in Harmony is a Virtue is a highly conservative woman who hates physical touches. Besides enjoying her personal space, Kate is very protective of her little sister (Tracy Chu). In the scene filmed yesterday, Tracy helped Joe with his broken car. Kate immediately went over and kicked Joe in the shin, thinking that he was harassing Tracy. Kate jokingly stated that Joe is too tough to be hurt by her. Hope that she will get better soon! !